by Kati Barklund — The workplace really matters and is becoming a more and more important differentiator between successful and less successful organizations. 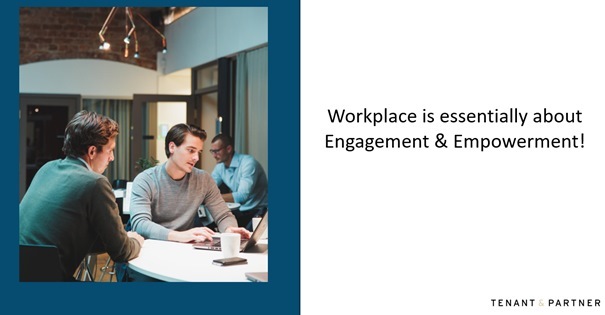 As FMs we have a huge responsibility in helping our customers creating performing workplaces, and to do so we must truly understand what workplace is all about and the keys to creating performing workplaces. And, we know for sure that the workplace strongly affects all these areas. So, the workplace really should be used as a strategic tool to support work, collaboration and innovation; to shape the experience of the brand and organization; to develop a high-performing culture; and to produce competitive advantage for the organization. If we are not aware of the relationship and do not treat the workplace as a strategic tool, there is an overwhelming risk that the workplace instead has a negative impact regarding both attractiveness, productivity, efficiency, sustainability and security. What is the main purpose of the workplace? So, what is the workplace all about? Workplace is above all about engagement and empowerment of the people in the organization. It is for the people in first place that we have the workplace. To enable them to perform at their best whatever their task, role or responsibility is, and whatever personality, background or preferences they have. We lead and unite the power in the people through an engaging mission (why are we doing what we are doing – what is our role, what is our purpose, how are we contributing to a better world) and give direction through a challenging and inspiring vision (where are we going, what do we want to achieve). Then we support and provide the best possible conditions so that people want and can do their best work realizing their potential and our mission, vision, strategy and goals. Ultimately, the workplace is about realizing the potential in the people and the organization. How can we contribute to the value-addition? A performing workplace creates conditions for our customers to achieve their specific goals and visions. We develop workplaces and ways of working in order to enable and enhance realization of these values. Traditionally we have had, and still have in most cases, a few traditional silo workplace functions in organizations – HR, IT, CRE/FM. And yes, FM has really much been a silo-function as well. These workplace functions have also more or less been working individually and independently, and sometimes it has even felt that these departments have been run for their own sake and that we have forgotten the real purpose of these functions. We must of course make sure that we are united in our work across the workplace related functions and disciplines and realize that we are all here for the same purpose, and only together we can make it. The workplace and workplace experience is simply a sum of our physical workplace, our digital workplace, and the culture and leadership in our workplace and organization. All these parts are so closely intertwined together and highly dependent on each other, so coordinating and aligning these workplace parts is essential when creating performing workplaces. And, it is not enough to do this merely on project basis, like when we for example move towards activity-based working. We must also very much align these on a strategic level. 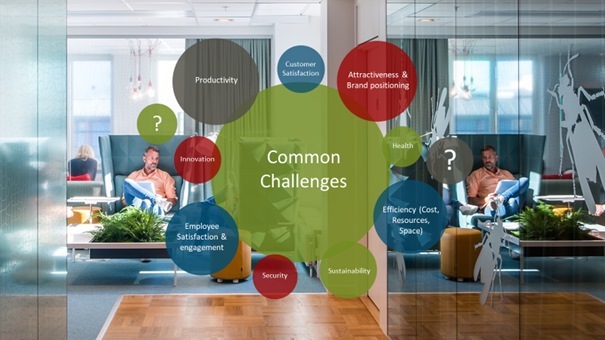 Only then, we can make sure that we are doing and prioritizing the right things together, so that we will be able to achieve high-performing workplaces that are both attractive, productive, efficient, sustainable and secure. Workplace is a journey, not a destination! Traditionally we have seen the workplace more as a project, than a process. The only thing though we can be sure of today is that everything is changing and this in ever increasing pace. We must therefore make sure that we continue to support, engage and empower our people in their work over time. That we do by continuously monitor the changing needs of the people, the business and operations; the changing conditions and the ongoing development within for example technology; and then continuously adapting and developing the workplace accordingly, so that it stays high-performing – also over time, and not just in the beginning after a change. Organizations today go through huge transformation in many areas to stay ahead and relevant. 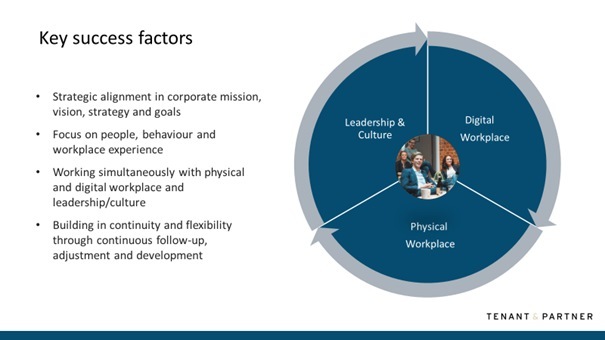 Most of these transformations unfortunately fail to deliver the target impact, and the main reason for this is that we fail to change our leaders’ and employees’ behavior. This is unfortunately often the case for Workplace transformations as well. Culture really is the King here. We can have the most perfectly fit physical and/or digital workplace, but we won’t realize the value of it unless we change our culture and leadership, our way of working. And, as an individual I will not change my behavior until I believe that there really is something in it for me, and even though I know there is something in it for me – I might not change for several reasons. Power of habits, fear of change, lack of time or maybe I just do not know how to. There can be so many reasons behind it, but one thing is sure, and that is that we as organizations have so far spent far too little time and effort in supporting and managing the culture and behavior change. This must change and we need to drive this change, otherwise we will not realize the value out of our workplace investments. Seeing and treating the workplace as the powerful strategic tool that it is, and aligning it with the organizational mission, vision, strategy and goals. This is our starting point. Why are we doing what we are doing? What is our vision? What do we want to achieve? What is our strategy and goals? How can we use the workplace as a strategic tool in this journey? Realizing that workplace is essentially about engaging and empowering the people in the workplace, nothing more and nothing less. Of course, it needs to be cost-efficient too, but that is definitely not our main objective and priority with the workplace. There are so many more and larger values beyond cost-efficiency. Working simultaneously with the leadership and culture, physical and digital workplace. These workplace parts are so intertwined together and dependent on each other, and these together – not individually – create the workplace experience. We simply need to treat the workplace as process, instead of as a project. Continuously monitoring, adapting and developing the workplace to changing needs, prerequisites and possibilities, so that it also stays attractive, supportive and performing over time. Let´s together help our customers creating performing workplaces, so that they can realize the potential in their people and organizations! Workplace really matters. Kati Barklund works as Sr Workplace Strategy Manager at Tenant & Partner, helping clients realize their potential through Performing Workplaces®. Kati has worked in forefront within both physical and digital workplace areas, including Microsoft, Coor, and Skanska. She is also part of the Leadership team of WE (Workplace Evolutionaries).